GoldFynch features a robust search engine that offers a great deal of functionality and flexibility. The search bar, always found at the top of the GoldFynch interface, allows for quick and easy initiation of searches. Just type a phrase into the search bar while in the ‘suggestions’ tab of the search bar and hit the enter button to perform a quick search. Once a search has been made, the results can always be found by navigating to the ‘Search’ view from the left pane. Once you’ve carried out a search, you’ll find filters in the right side panel to help you narrow down searches. 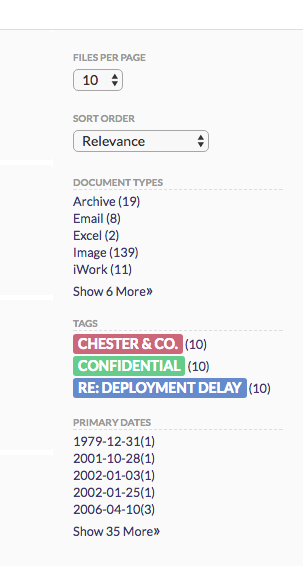 The filters include Document Types, Tags, Primary Dates and Custodians and Sources.